Skinny Drumsticks with Halo Top Ice Cream. OMG! These are absolutely amazing! 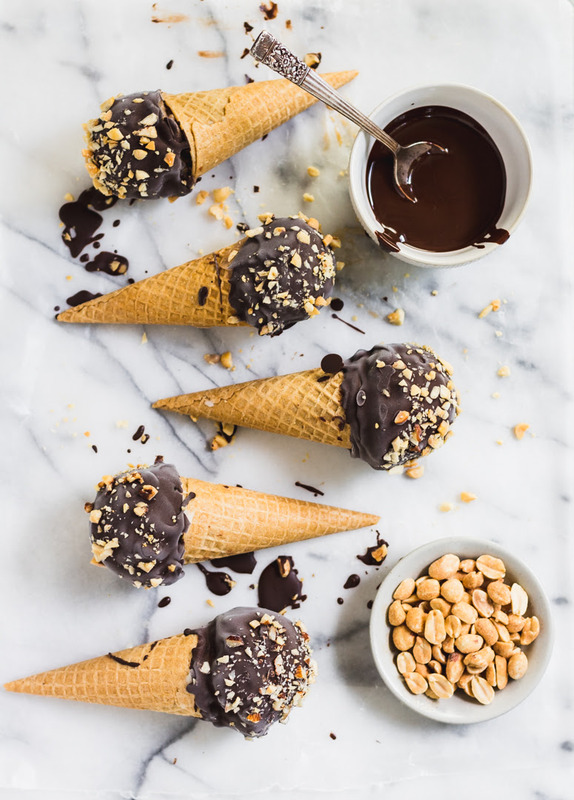 It’s a gluten free sugar cone, the inside coated in dark chocolate with a dollop of dark chocolate and peanut butter at the bottom of the cone, topped with Halo Top peanut butter ice cream, and coated in a rich dark chocolate ganache and roasted salted peanuts. It’s a lightened up, but still delicious and decadent take on a favorite childhood ice cream treat. 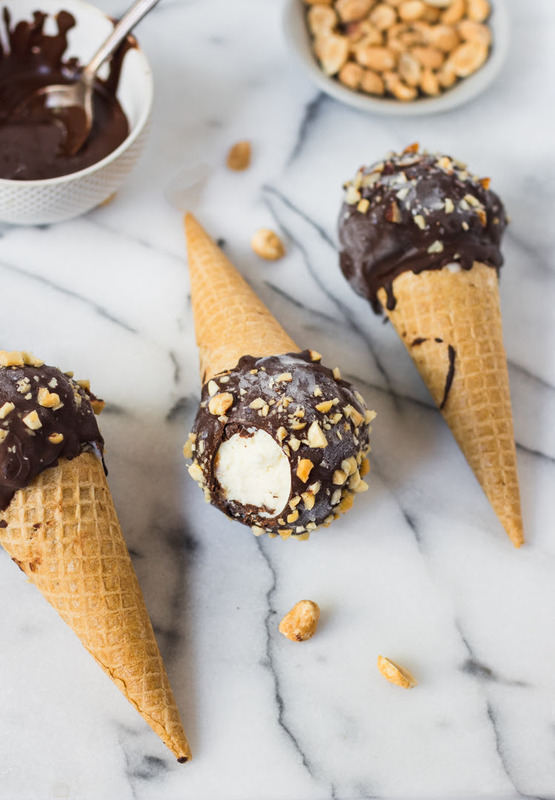 Raise your hand if you love ice cream….Now raise your hand if you love Drumsticks!! 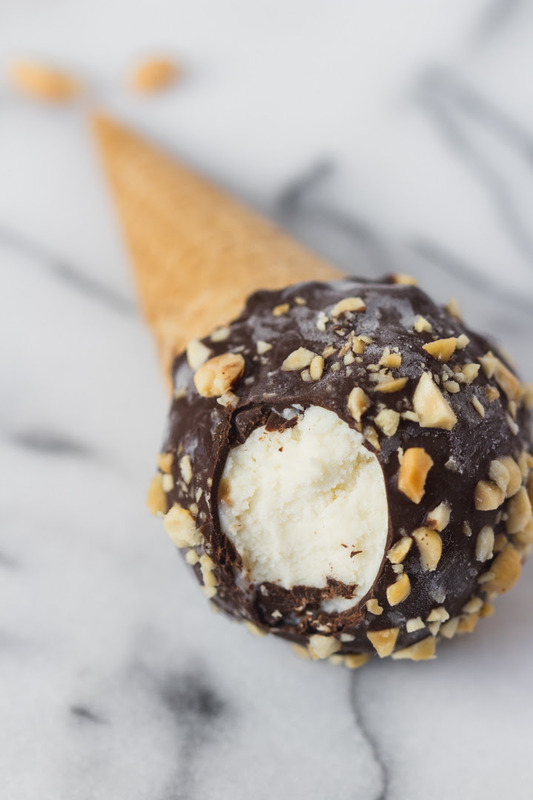 You know – that childhood ice cream cone treat that was coated in chocolate and peanuts with the surprise chocolate bit at the bottom of the cone. Yummmmmm! Ok to be perfectly honest, I had totally forgotten about drumsticks too, until just recently. Last Friday, my husband, his parents, and I went to the cubs/cards game in Chicago, rooftop seats. If you are not familiar with rooftop seats, they are a group of residential buildings behind Wrigley Stadium that have bleachers on the rooftops where you can watch the game. The rooftops are also all you can eat and all you can drink. I’m talking unlimited ice cold beer and ball park staples, like hot dogs and nachos. It’s pretty awesome! They also had a ice cream freezer filled with tons of old school treats, like ice cream sandwiches, fudge bars, and of course, drumsticks. Naturally, I went straight for the drumstick and it transported me right back to my childhood. I remembered how excited my brothers and I would be when our mom let us pick up a pack of drumsticks at the store. It would be an after dinner treat if we were good and did all of out homework that night. I always ate mine way too quickly because I was so excited for the last bite at the end of the cone that was filled with the fudgy rich chocolate. You know the part I’m talking about. That magical last bite! The drumstick didn’t disappoint at the game. It was as delicious as I had remembered. But there was one thing I seemed to block out from my memory: how many calories and sugar were in this little treat. Now, I’m a strong proponent for letting yourself indulge and enjoy a special treat. The real deal. And that’s what I did at the game. No guilt! However, as you all know from my blog, I also love to recreate usually not so healthy favorites and give them my Danilicious spin. I truly believe all foods can be enjoyed if you make simple little swaps. This seemed like the perfect opportunity to healthify one of my favorite childhood snacks. ohhh and I did just that….I think I made it even better than the store bought kind. This is a no bake dessert – it simply requires good quality ingredients and a little patience for assembly time. Melt the Dark Chocolate. Add the chocolate chips and coconut oil to a microwave safe bowl. On 50% power, microwave the chocolate chips in increments of 30 seconds, until completely melted and smooth. Stir in pinch of sea salt. Prepare Cones. Set cones in a low ball glass so they stand up and are easier to work with. Dollop a small spoonful of the melted chocolate in the bottom of each cone. Add a small dollop of peanut butter to the bottom of the cone as well. This is to create a dark chocolate peanut butter surprise at the bottom of the cone (a delectable last bite!) Next, with a pastry brush (or spoon) coat the inside of the cone with the dark chocolate ganache. Set in freezer for 15-30 minutes, or until chocolate has hardened. Scoop the Ice Cream. 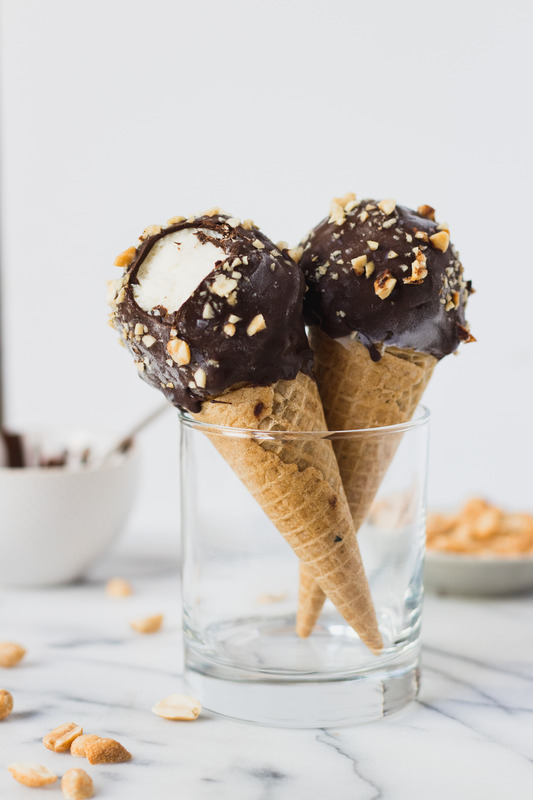 Next, add a scoop of ice cream (I recommend using an ice cream scoop to create uniformed scoops) to the top of each cone (make sure the inside of the cone gets ice cream as well). It should take about 2 pints of Halo Top. Set in freezer to harden, about 30 minutes to an hour. Coat the Ice Cream. The chocolate may have hardened slightly at this point. If so, simply microwave it again at 50% power in increments of 30 seconds, until it is smooth and silky again. 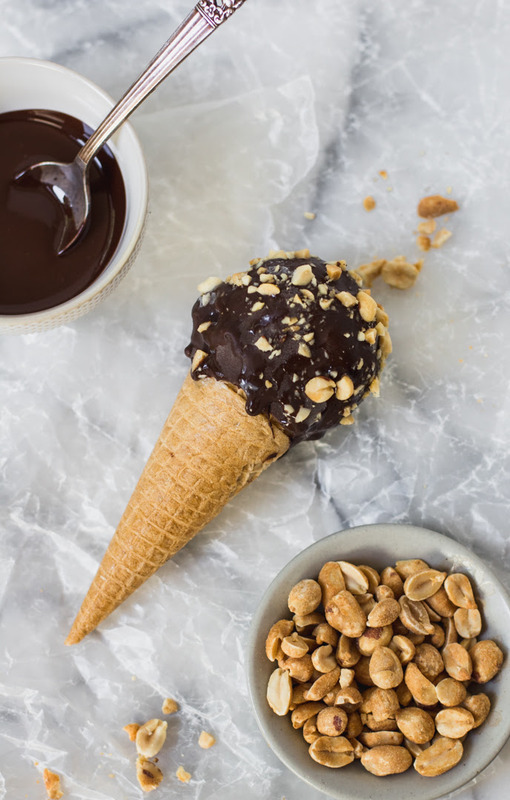 Holding the cone part, dip the top of the cone with the ice cream scoop into the chocolate, making sure the entire ice cream scoop is coated in the chocolate ganache. Sprinkle with roasted chopped peanuts. Set on the lined baking sheet. Complete this process for all of the cones. Immediately place the drumsticks in the freezer. Let set for at least an hour. Time to Eat. Take a big bite and be ready to be transported back to childhood! You guys. These are seriously good. The dark chocolate coating is rich and fudgy. 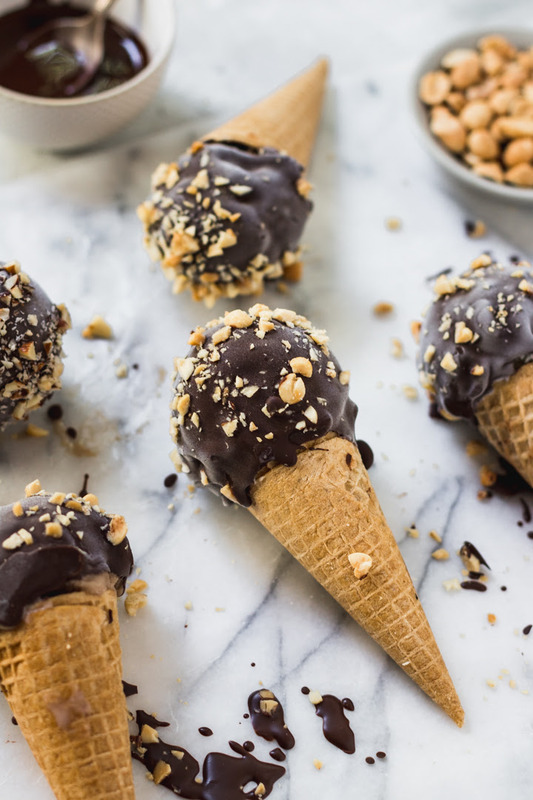 The ice cream is so creamy and delicious – plus the addition of the peanut butter and salted caramel flavors makes it extra tasty and pairs so well with the dark chocolate. The crushed peanuts add crunch and a little salty goodness. Then the cone. My favorite part. The first fews bites are a great combination of the cold, creamy ice cream and crunchy chocolate cone. But the best part for me will always be the last bite. And the addition of peanut butter with the dark chocolate make for an unforgettable one. I promise you will love these as well. So don’t wait! Go grab the ingredients and make them this weekend! You will be very happy you did! A skinny, but still delicious and decadent take on a favorite childhood ice cream treat. Add the chocolate chips and coconut oil to a microwave safe bowl. On 50% power, microwave the chocolate chips in increments of 30 seconds, until completely melted and smooth. Stir in pinch of sea salt. With a pastry brush (or spoon) coat the inside of the cone with the dark chocolate ganache. Set in freezer for 15-30 minutes, or until chocolate has hardened. Next, add a even scoop of ice cream to the top of each cone (make sure the inside of the cone gets ice cream as well). It should take about 2 pints of Halo Top. * Set in freezer to harden, about 30 minutes to an hour. The final step is to coat the ice cream in the dark chocolate mix. Line a baking sheet with parchment paper and set aside. The chocolate may have hardened slightly at this point. If so, simply microwave it again at 50% power in increments of 30 seconds, until it is smooth and silky again. 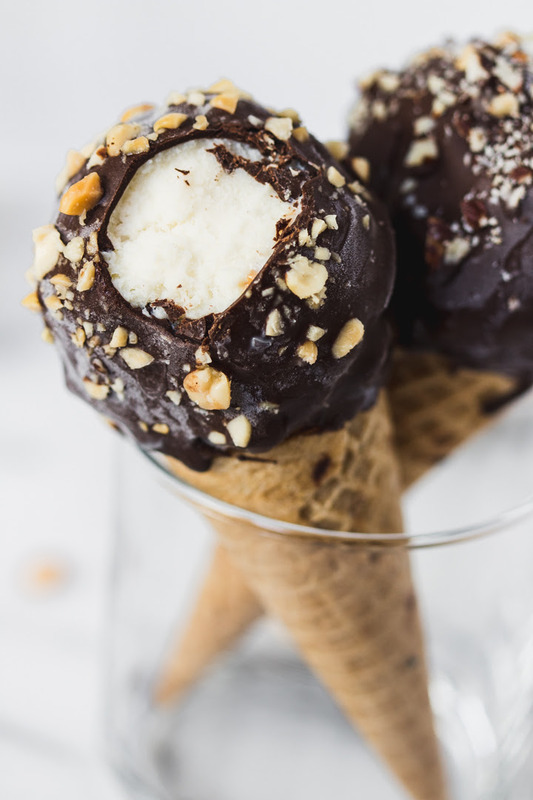 Holding the cone, dip the top of the cone with the ice cream scoop into the chocolate, making sure the entire ice cream scoop is coated in the chocolate ganache. Sprinkle with roasted chopped peanuts. Set on baking sheet. Complete this process for all of the cones. Immediately place the drumsticks in the freezer. Let set for at least an hour. Serve, enjoy, and be ready to be transported back to childhood! *I used the peanut butter and salted caramel Halo Top pints as both went well with he dark chocolate, peanut butter in the cone, and roasted peanuts. You can choose any flavors you think will also pair well to customize it to your liking!